Parachute, Single point, quick release with seat pack. Type C-2. Stores reference 15A/197. Commonly referred to as the 'pilot's parachute'. Classic white webbing with a central black fleck. 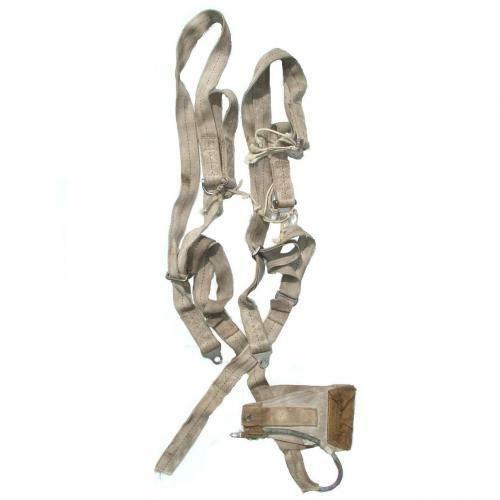 Here we have an original WW2 harness. It has been partially cut, has missing straps and lack some of the metal buckles/adjusters and quick release (QR) box. Two of the QR box plates are still attached as are two metal strap buckle/adjusters and the rings to which the canopy lines are attached. It also has the canvas waistbelt, fabric ripcord handle housing and armoured metal tube ripcord housing. No pack or backpad. The webbing is soiled. Sold for spares or repairs. We have few more of these in similar condition Stock code M19596/M6558.